Deemed as the abode of God, Himachal Pradesh is indeed a divine land for all the devotees. Known as the land of temples, it is visited by people from across the globe. From Hindu temples to Jain temples to mosques, the landscape of Himachal Pradesh is dotted with multiple shrines. The diverse and colorful landscape of Himachal Pradesh is filled with houses of Gods and Goddesses dedicated to different religions. Himachal Pradesh can be described as the land of pilgrimages, mystical customs, and rituals. The land of vivid custom is blessed with supernatural powers which attract tourist from across the world. Embark on a journey to Himachal Pradesh to witness the magnificent shrines. 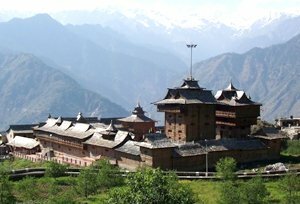 Bestowed with magnificent valleys and mountains, Himachal Pradesh is referred to as the earthly abode of Lord Shiva, Goddess Parvati and Goddess Durga .Himachal Pradesh is an ideal destination for a delightful spiritual journey which will take one through the most scenic trails of the Himalaya. From the ancient stories associated with Baijnath to the distinctively epic Hidimba Devi Temple, there are hundreds of amazing shrines in Himachal Pradesh. From water to sculptures to stone, gods can be found here in every form. The people of Himachal Pradesh are blessed with spiritual thoughts and vivid customs. On one hand there is the highest statue of Lord Hanuman which can leave anyone mesmerized, while on the other hand there is Manimahesh which can enthral the tourist with its beauty. A sacred and spiritual journey to Manimahesh can be completed with dedication and motivation. Himachal Pradesh is the abode of Goddess Durga. There are seven Hindu pilgrimage sites in Himachal Pradesh dedicated to the different incarnations of Goddess Durga - Mata Chamunda Devi (Kangra), Mata Jwala Ji (Kangra), Maa Kangra Devi (Kangra), Maa Chintpurni Devi / Mata Chhinnamastika Dham (Dharamshala), Mata Naina Devi (Bilaspur), Mata Mansa Devi (Hasampur), and Mata Kalika Devi (close to Shimla). On a tour to Himachal Pradesh, a tourist shouldn't forget to add Bijli Mahadev temple, a high altitude temple located amidst the lofty mountains. Legends say that the stick located on the top of the temple attracts lightning and thunder. Another important religious yet ancient site in Himachal Pradesh is the Hadimba Temple which is famous for the sheer art of amazing stone carvings. Devoted to Hidimba Devi, Bheema's wife in the Mahabharata, it is a one of its kind temple which is flocked by devotees all through the year. 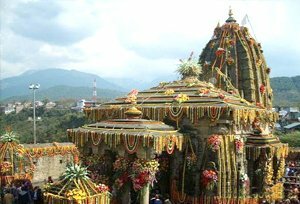 Other important temples located within the vicinity of Himachal Pradesh are Bhimakali Temple, Hatkoti Temple (Shimla), Jakhu Temple (Shimla), Sankat Mochan Temple (Shimla), Renuka (Mandi), Trilokpur, Baba Balak Nath Temple (Deothsidh), Baba Basandi (Bilaspur), Badol Devi (Bilaspur), Naras Devi (Bilaspur), Shitla Mandir Jangla (Gehrwin), Shivalaya Bachhretu (Hamirpur), TaraDevi Temple (Shimla), Raghunathji Temple (Kullu), and Bheemakali Temple (Shimla). 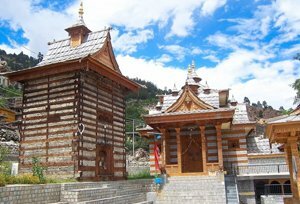 All these temples are certainly the best places to visit in Himachal Pradesh. The divine experience one has on their spiritual tour to Himachal Pradesh is certainly out of this world; so don't forget to visit this holy place on vacations.